The Chicago Bears may not have their early draft picks for 2019, but that doesn’t mean the ones they have left are worthless. Chances are still there that they can find good players. As always it’s a matter of finding them. The first big event that helps towards this endeavor is the Senior Bowl. This is where the top senior players from around the country are invited to Mobile, Alabama to participate in a week-long series of practice culminating in a game. It’s a great way for teams to get a look at top prospects being put into an NFL-like environment to see how they respond. If that weren’t enough, teams are also able to get extra details on players who might be flying under the radar. Ones you can expect to be there in the 3rd round or later. Even undrafted free agents. Such things matter because those avenues yield good players all the time. The Bears have to do their homework in order to be prepared. So who are some potential names that will likely have their full attention by the end of business this weekend? It’s no secret the Bears might be on the lookout for a different option at running back. Jordan Howard is reliable and steady but head coach Matt Nagy was crystal clear. The running game wasn’t good enough. Howard averaged 3.7 yards in 2018. It’s clear the Bears are seeking somebody with more speed and explosion. It won’t take long for them to notice Tony Pollard. Memphis already produced one key playmaker on their offense in Anthony Miller. Pollard has exactly what they’re looking for. He shows good vision, acceleration, and speed to hit the hole. His hands a strong in pass catching and he doesn’t go down easily on tackle attempts. Bobby Massie will be a free agent this year. 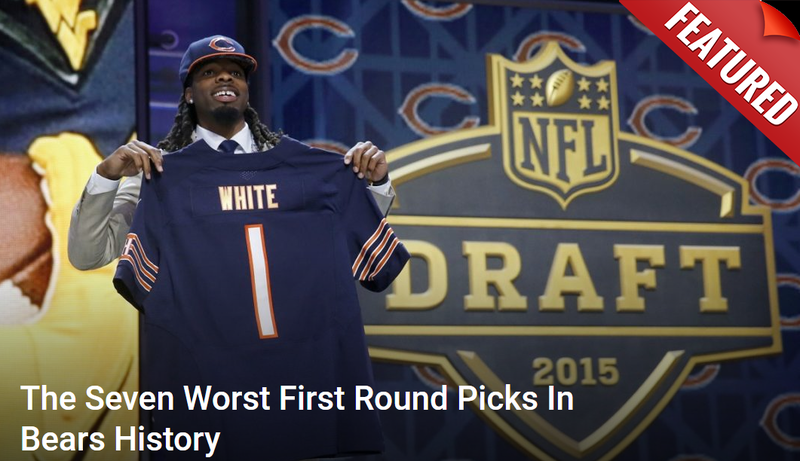 Even if the Bears bring him back, it’s likely they will start a search for his replacement. Nagy no doubt will want blockers who he feels fits his offense best. Massie was good in 2018 but there are limitations to what he can do from an athletic standpoint. That’s why Andre Dillard will appeal to them. The Washington State left tackle does what they no doubt want the most. He protects the quarterback and does it well. He’s big and strong with long arms but moves his feet well. His eyes are disciplined as he is able to move from one block to another. When it comes to getting on the move and guarding his QB? This guy has game. Remember that with nothing but mid and late round picks, Pace will have to take some chances on players from smaller schools in hopes he gets lucky. In those situations, it’s all about which prospect to take a chance on. The Bears could be looking at some depth issues at their edge rusher position. Aaron Lynch will be a free agent. Sam Acho is a candidate for release. They could be looking to add more help. Oshane Ximines certainly looks the part at 6’4″, 255 lbs. He moves well, showing an ability to play upright and makes full use of his hands to keep blockers off his body. He’ll bend the edge outside on one but and then run a violent counter inside on the next. He had 32.5 sacks and 52 tackles for a loss in four seasons for his school. Something to remember now. Chuck Pagano is in charge of the defense. While it will remain a 3-4 alignment in terms of scheme, there’s expected to be a shift in philosophy. Chief among them is the operation of the cornerbacks. Pagano loves to play man coverage across the board, not giving receivers any room to operate. That demands a different kind of cornerback. One who plays with physicality and some speed. It won’t take them long to notice Corey Ballentine under those conditions. Don’t be fooled by his small school upbringing. This kid is a battler. He’s not afraid to get after receivers and has the recovery speed to hang with them down the field. The last time the Bears drafted a kicker was way back in 2000 when they selected Paul Edinger. After two failures on the free agent market with this Cody Parkey debacle, it stands to reason they may want to look that way again. If so, the name Cole Tracy has to be on their radar. The guy has been money for LSU. He went 29-of-33 during his senior season and has a reputation for being ice cold under pressure. He’s got plenty of leg to hit from beyond 50 as well. Doing most of his damage in the competitive SEC hasn’t hurt either. If the Bears want somebody who doesn’t seem phased by big moments, this is the one.